Have you noticed a strange thing with your older iPhone 5s, iPhone 6 or iPhone 7 or any version of iPhone? If you have checked properly you will have noticed that your current iPhone has become appreciatively slower. Many Apple fanboys insist that Apple intentionally slows down all older iPhones everytime it releases a newer iPhone. Some have even got a name for this tactic “planned obsolescence.” in order to encourage iPhone owners with older devices to upgrade to a new device. However, there is no data or proof that acknowledges that Apple is engaging in any planned obsolescence. What is Apple’s Planned Obsolescence? Planned Obsolescence is when a company forcefully degrades its older product to make its users buy the newer latest product. Apple has been accused of doing this ever since the first iPhone was launched. Now with the release of iPhone 8 and iPhone X, Apple seems to be deliberately slowing down older iPhone 5S, 6, and iPhone in order to encourage iPhone owners to buy its new costlier iPhones. While planned obsolescence is a tactic which has been acknowledged even by experts, there is no data or proof that acknowledges that Apple is indulging in such activity. Yes, many reports on various forums suggest that iPhone owners are complaining about their iPhones getting slower and Apple is to blame because this has started happening since Apple launched its new iPhone 8 and iPhone X. As said above, this is not the first time Apple has done this. Apple has been accused of ‘planned obsolescence’, making old iPhones less useful so that you buy the new model. Similar allegations were made on Apple after it had launched its latest iteration of iPhone operating system iOS 11. The latest version of iOS 11 doesn’t support the older iPhones making them obsolete. Many in the industry feel that Apple is doing this to market its new 10th-anniversary special edition iPhone X which is dubbed as the costliest iPhone ever. Google had also reported a sudden rise in searches like “iPhone slow” or “iPhone slowed down” before the release of the new model, which suggests a large number of iPhone users have started facing problems with their phones even before iPhone 8 and iPhone X were launched. 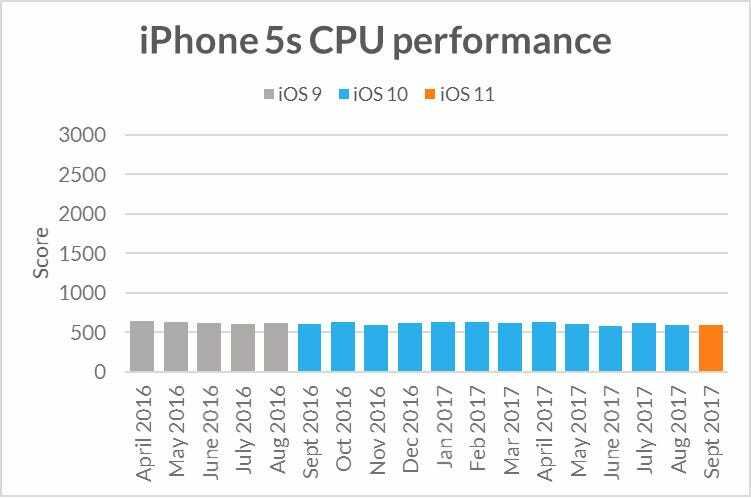 Futuremark, a benchmarking website tested various old iPhones to check whether they have slowed down since Apple launched iPhone 8 and iPhone X. The tests reveal that processing chips inside iPhones as far back as the 2013 iPhone 5s perform just as well while running Apple’s latest iOS 11 as they did when they ran iOS 9, which was released in 2015. Researchers at Harvard University conducted a study on this planned obsolescence by Apple after many reports appeared accusing Apple of sabotaging its older iPhone models. The study was a dud because Harvard guys found that there was a spike in Google searches for “iPhone slow”, spike around the time of the release of a new model. It never dealt with the technical angle about the accusation. Strangely, the study says that it could be a psychological phenomenon that iPhone owners have faced every time Apple releases a new iPhone. iPhone owners are subjected to a lot of media hype about the new iPhone models causing them to believe that their old iPhone has slowed down. Since there is nothing wrong with the older iPhones they use, the desire to buy the latest models manifests as the anxiety about the performance of the older model. They tend to notice the performance issues more just around the time of the release of the new model. While there may be some iota of truth in the Harvard study, who can explain the reason behind Apple releasing iOS 11 just before the launch of iPhone 8 and iPhone X. iOS 11 doesn’t support many old iPhone models so it can’t be said that this is just a psychological or behavioral problem. I own an iPhone 7 and I do feel that it has slowed down but I have no proof that Apple is doing this.